This wonderful breed was developed by early American settlers, originally mixing Morgans and Thoroughbreds beginning in the 1820's. Later, they introduced the Saddlebred and Tennessee Walking Horse blood. This breed gets its name from its unusual gait where it walks quickly with its forelegs and trots with its hind legs. It can sustain this smooth movement for a long period of time. Usually ridden in Western saddle, it is a sure-footed trail horse over rough ground, and a common show horse. At show no artificial appliances such as false tails are allowed, and no weighting of the hooves. You would think with the unusal gait that the rider might be uncomfortable. But just the opposit is true, the rider does not feel the effects of the movement. Other gaits of the Fox Trotter include the cantor, and the "four-time walk", performed with the hind feet overriding the front track. 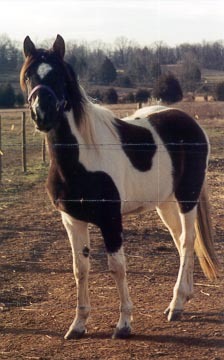 The Missouri Fox Trotter comes in all colors, but mainly chestnet, and stands at 14-16 hands in height. Read the next horse breeds article on Morgan Horse.